The month of May, 2016, has reportedly witnessed a limited decline in the number of violations against media freedoms in Palestine, compared to the previous month. According to the PNN, the Palestinian Center for Development and Media Freedoms “MADA” monitored a total of 26 violations against media freedoms (where 16 violations were committed by the Israeli occupation, and 10 violations were committed by different Palestinian apparatuses while, during April, an overall amount of (29 violations) committed by both Israeli and Palestinian parties. Israeli violations ranged from targeting five journalists with rubber-coated metal bullets, tear gas bombs and Stun grenades, to sentencing two journalists, rather than detaining, three other media graduates, and two other cases of banning from coverage, 3 cases of detention and interrogation, one case of banning from travel, one case of confiscating media materials and a case of humiliating security check of a reporter before entering a press conference for the Israeli and the French prime ministers, once he refused this humiliating treatment and impeded the coverage of the conference. On 02/05, the Israeli military confiscated a collection of photographs belonging to MADA, and featuring Israeli attacks and violations against Palestinian journalists and media outlets, whilst Ali Mohammad Sabbah, the director of Al Haya Center for Art and Culture was intending to transport them to Jerusalem, through Qalandia checkpoint, for an exhibition on the occasion of World Press Freedom Day, whence he was detained for long hours, rather than being summoned and interrogated several times. On 03/05, several journalists were injured, including a reporter for 24A.E, Ali Naser Obeidat, and Mohammad Abu Shusheh, photographer and director of Roya TV Chanel. Moreover, photographer and journalist Zaher Abu Hussein was injured with bruises and partial burns, due an attack by the military against a peaceful demonstration organized by the Palestinian Journalists Syndicate in solidarity with journalist Omar Nazzal. On 06/05, correspondent for Palestine TV in Qalqilia, Ahmad Abd Al Malek Othman- Shawar, was injured with two rubber bullets that hit his hand and leg while he was covering a demonstration against settlements in Kafr Qaddoum. On the same day, Almuthana Samir Deek, videographer of Trans-media agency, was hit with four rubber bullets in his hand, leg and shoulder by Israeli forces. On 23/5, Nayef Safadi, the director and photographer for the European News Agency- EPA in Palestine and Israel, was exposed to a humiliating security check, by Israeli security forces, as he was entering at the Israeli Prime Minister’s office in Jerusalem, to cover a press conference. Moreover, on 25/05, the military detained Izzat Saleh Ahmad (23 years) media graduate from Al Najah National University, from his home in Kafr Al-Deek, Salfeet Governorate. Meanwhile, Israeli intelligence banned the correspondent and editor of “Al Quds International Press” news agency, Khaldoun Zakaria Mathloum, from travel, while attempting to participate in a media conference in Turkey. On 30/05, Israeli forces also banned the photographer of the Chinese News Agency “Xinhua”, Nidal Shafeeq Ishatyeh, and AP photographer, Majdy Ishtayeh, from covering a raid carried out by the military in Salem Village, Nablus governorate. Different Palestinian apparatuses, in both the occupied West Bank and the Gaza Strip, committed a total of 10 violations against media freedoms (5 in west Bank, 5 in Gaza), ranging between detention and arrest, 5 cases of summoning and interrogating journalists, and two threats and incitement rather than confiscating equipment. On 02/05, Palestinian intelligence summoned Adib Barakat Attia (26 years), whereupon he was detained and interrogated. He was summoned several times after coming back from studying in Cyprus (Masters in Media). On 9/5, the chairman of Al –Eqtesadeya (the economic) newspaper in Gaza, journalist Mohammed Khaled Abu Jyab, was threatened by the chairman of contractors in the Gaza Strip, after posting comments on Facebook regarding transporting cement into Gaza Strip. 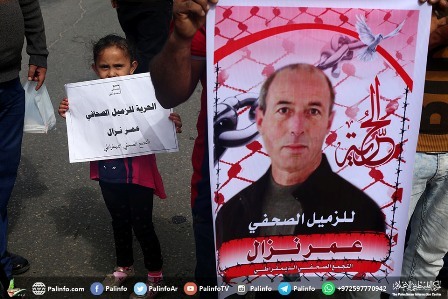 On 16/05, internal security in the Gaza Strip summoned the correspondent of “Wattan” and a volunteer at the radio, “Sawt AlSha’b”, Ezzedine Abu Aisha, who was interrogated twice, rather than the degrading and inhuman treatment that can amount to torture. On 16/05, Palestinian intelligence took into custody the correspondent of “Al Aqsa TV”, Tareq Abdelraziq Abu Zeid, from his home in Nablus (still under arrest). On 23/05, Palestinian intelligence also summoned the correspondent of “Al Quds” in Bethlehem, Mamdouh Mahmoud Hamamrah, while heading back home after participating in a media conference held in Turkey. On 24/05, freelance journalist Amjad Ayman Yaghi was exposed to threats and inciting campaign after publishing an investigative report in the Lebanese newspaper “Al Akhbar”, about sexual harassment against women in Gaza Strip. NABLUS, (PIC)– The Israeli Occupation Forces (IOF) imposed Thursday evening a curfew on Hawara village, south of Nablus to the north of the West Bank. Israeli 0404 website claimed that the curfew was imposed shortly after a settler’s car was allegedly subjected to a stone-throwing attack near the town. The Israeli driver was slightly injured during the alleged attack, according to the sources. The town’s mayor Nasser Hawari affirmed that Israeli forces were deployed in large numbers throughout the town after closing its entrance. The PIC reporter quoted local sources as saying that dozens of residents were stopped and searched while combing operations were carried out in the main roads of the town. IOF soldiers also closed Hawara and Awarta checkpoints, preventing dozens of Palestinian vehicles from having access to the town. Since the beginning of the holy month of Ramadan, Israeli forces have taken over seven local houses and have barricaded themselves on their roofs. NABLUS, (PIC)– Hundreds of settlers Thursday morning stormed Bernat historic site in the Asirah Ashamaliya town near Nablus and performed Talmudic rituals at the place under Israeli army protection. The town’s municipality president Naser Jawabrah told the PIC reporter that settlers claimed that the site has monuments of a Jewish alter in disregard to the fact that the site is owned by Palestinian citizens who possess official documents that prove their ownership of the land. Israeli government in April, 2015 announced inauguration of the site as the altar of Joshua for settlers, urging them to perform Talmudic rituals at the site as a Jewish historical holy place. RAMALLAH, (PIC)– Families of Palestinians slain by Israel called on Tuesday for bringing Israeli officials before the international criminal court for withholding dead bodies. “We have doubts that our detained children are still alive and that their bodies have been withheld for unknown reasons. Israel has to prove the opposite,” spokesperson for the popular campaign to release the bodies of slain Palestinians, Muhammad Alyan, said. According to Alyan the families’ concerns that their children might be alive have been triggered by Israelis’ reluctance over the release of dead bodies along with their refusal of appeals to inspect the dead bodies by the Red Cross. In addition no single medical report has been issued on the matter. The families raised concerns that their children’s bodies might have been tortured to death by Israel and that some of their organs might have been eviscerated. The father of the slain Palestinian youth Hassan Manasreh could only identify his son through a sign in his foot, the activist stated. Secretary General of the Palestinian Initiative, Mustafa al-Barghouti, said Israel’s detention of slain youths’ bodies represents a serious violation of human rights conventions and emanates from a policy of collective punishment against Palestinian families. He harked back to the statement released by the Israeli war minister Avigdor Lieberman who said: “We are in a state of war with the families of slain Palestinians. We will continue to withhold the dead bodies.” “What has been going on is an act of terrorism against the Palestinian people,” said Alyan, adding that Israel is stipulating new terms to prevent the families from attending their children’s funeral processions. He said Israeli conditions to restrict the number of funeral attendants and prescribe the time and place of the burial raises concerns that the withheld Palestinians might have not died yet. He called for appealing to the ICC to impeach the Israeli criminals. The bodies of at least eight Palestinians are still being withheld by the Israeli occupation authorities out of a total of 112 bodies detained since the start of the Jerusalem anti-occupation Intifada. Arab48 obtained information that the Israeli government is planned to discuss, during its weekly session on Sunday, a plan to implement demolition orders in Arab towns. Likud ministers, Ze’ev Elkin and Yariv Levin presented a comprehensive plan to the government “to implement the organisational and building laws”, which mainly target Arab towns that have tens of thousands of unlicensed homes. A number of academic studies conducted on the issue of unlicensed construction in the Arab towns have confirmed that the situation is a result of the Israeli government’s policies against the Arab community. This proposal has come days after Israeli Finance Minister Moshe Kahlon announced that the five year plan to upgrade Arab towns has been frozen due to Israeli Prime Minister Benjamin Netanyahu’s insistence on “implementing construction law”, according to him, i.e. executing the demolition orders in the Arab towns. The plan aims to speed up the implementation of the demolition orders and achieving the process of issuing demolition orders in the courts in order to issue and implement them quicker, as well as allotting budgets to fund police and demolition forces. These are the final days of Khaled Meshaal’s leadership of the Hamas political bureau. Meshaal’s influence in the movement has been declining ever since he bet on the wrong horse and moved from Damascus to Qatar, where he did not find the support he had hoped for. Now his downfall is apparently about to be official and final. The Meshaal era in the Hamas movement is coming to an end with a whimper. The London-based Al Wattan newspaper reported June 13 that the movement’s leader informed his associates in Qatar, where he has been living since leaving Syria and falling out with Iran, that he had decided not to run in the year-end elections for leadership of the political bureau and Hamas’ decision-making body, the Shura Council. About a year before Hamas’ last internal elections in April 2013, Meshaal had considered stepping down and even announced at one point that he wouldn’t run. He feared that Hamas’ military wing in Gaza, Izz ad-Din al-Qassam Brigades, would torpedo his campaign. But after Israel’s November 2012 assassination of al-Qassam Brigades leader Ahmed Jabari and Israel’s Operation Pillar of Defense that followed, Meshaal came to Gaza and started rebuilding his status. He delivered a “victory speech” in the Square of the Unknown Soldier in Gaza City and announced that he would heed the call of the movement and continue to lead its political bureau. This time, given his current standing in Qatar and the grim circumstances of Hamas, Meshaal understands it’s over. Even if, by some miracle, he manages to overcome the forces and currents arrayed against him in the deeply divided movement, there’s no way he will be able to extricate Hamas from the quagmire in which it is sunk. Mousa Abu Marzouk established the political bureau of Hamas with painstaking efforts in the early 1990s from his perch in the United States. When the FBI arrested Abu Marzouk in 1995 and proceedings were begun to extradite him to Israel, Meshaal, who was then residing in Amman, was entrusted with directing the political bureau. He continued to hold onto the job, which consisted mostly of fundraising for Hamas, even after Prime Minister Benjamin Netanyahu waived Abu Marzouk’s extradition to Israel. Meshaal’s standing as the movement’s undisputed leader was cemented after he narrowly escaped a 1997 assassination attempt by the Mossad in Amman. To appease Jordan’s anger over the attempted assassination on its soil, Netanyahu was forced to release Hamas’ spiritual leader, Sheikh Ahmed Yassin. Yassin’s release from an Israeli jail was considered a major achievement and credited to Meshaal. After the March 2004 assassination of Yassin and of his successor Abdel Aziz al-Rantisi a month later, Meshaal became the movement’s most senior figure. He decided to push forward dramatic moves that turned Hamas into a power-hungry political movement. His leadership from Damascus is credited with bringing the movement to power in the 2006 elections. Since then, however, he has made nothing but mistakes. The leaders in Gaza complained that Meshaal, out of the range of Israel’s security agencies, adopted an overly militant policy that had already resulted in a catastrophe for Gaza. Senior Hamas figures Ghazi Hammad and Ahmed Yousef were reported to have traveled to Damascus specifically to tell Meshaal and other members of the political bureau to their faces that they were responsible for Gaza’s destruction in Israel’s Operation Cast Lead in December 2008. But the main thrust of the criticism was and remains the contention that after Hamas’ electoral victory and its establishment of a government to rule the Gaza Strip, there was no longer any reason to have a leadership in exile. The head of the political bureau found a comfortable safe haven in Qatar and lost his power base and influence in Gaza in the ensuing years. Though in the past Hamas had needed Meshaal to raise funds for the movement around the world, now not only had his fundraising capacity declined, he had become a burden. Meshaal fell out with Iran and became anathema to the regime in Tehran. As long as he continues to head up the Hamas political bureau there’s no chance of improved ties with Iran, once one of the movement’s economic and military pillars. Haniyeh is indeed not blessed with a particularly strong backbone, but is endowed with two important traits: charisma and pragmatism. His fiery speeches and relatively moderate political approach — which attracted supporters from outside Hamas, too — led him to the top of the Hamas ballot in the 2006 elections. Nonetheless, over the years Haniyeh learned that moderate and pragmatic stands would not take him far in a movement whose powerful military wing has the final say. He thus became increasingly aggressive and militant until fully aligning himself with the most radical of Hamas leaders. The following story illustrates Haniyeh’s duplicitous character and conduct: Haniyeh had taken refuge in the home of his friend Samir Masharawi, a Fatah leader in the Gaza Strip, in the 2004 Israeli helicopter gunship blitz against the Hamas leadership. Masharawi hid Haniyeh in his home, where he arrived disguised as a woman. During the June 2007 military coup, artillery shells were fired at that same house. When the Izz ad-Din al-Qassam Brigades tried to wipe out his friend, Haniyeh did nothing and did not say a word to save him. Masharawi, who was considered a close associate and right-hand man of then-Fatah leader in Gaza Mohammed Dahlan, survived the shelling. But since then he has been telling everyone he knows that those perilous days are proof that Haniyeh is willing to sell out his principles and morality for his position, power and influence. In the previous political department elections in 2013, Haniyeh beat Abu Marzouk and was named deputy head of the bureau. In the coming elections, Haniyeh is likely to be named its head. Presumably, even in this position, he will not become the strong man of Hamas and will keep dancing to the tune of the movement’s military wing. Beirut-The Kataeb Party has decided to pull its ministers out of the Lebanese government at a time when the country’s security is shaken following a bomb attack on a bank located in Beirut. Kataeb leader MP Sami Gemayel said the resignations are intended to create “a positive shock” to fill the presidential vacuum and pave way for the functioning of state institutions which have been paralyzed for the past two years. The move of Labor Minister Sejaan Azzi and Economy Minister Alain Hakim to the side of the opposition will keep them in their caretaker capacity. Sources close to Gemayel told Asharq al-Awsat newspaper that the young leader of Kataeb is studying a work plan for the coming stage. The work plan on confronting the government will be based on three axes – political, judicial and street protests. It is mainly aimed at confronting the waste plan, which will turn the sea into a dump, said the sources. The two Kataeb ministers announced their resignations over the garbage plan which has been adopted by the government to resolve the waste crisis that shook the country for eight months last year. The resignations also came as a result of the controversial Janna Dam project which Change and Reform bloc chief MP Michel Aoun is pushing to build in the area of Jbeil, north of Beirut, amid wide objections over environmental concerns. The resignations were not welcomed by several parliamentary blocs. Minister Nabil de Freij, who is a member of the Future Movement, expressed surprise at Kataeb’s belief that the resignations would create a positive shock and would push towards the election of a new president. Information Minister Ramzi Jreij, who is the third minister to represent the Kataeb in the cabinet, has refused to resign. Jreij told Asharq Al-Awsat that he is not a party member, which means he is not compelled to abide by the decisions taken by the Kataeb politburo. The minister revealed that Gemayel has understood his stance. “It’s true that the cabinet’s work is paralyzed and most of the time it is not productive, yet it remains the only constitutional institution of what remains to be seen as legitimate in this country,” he said. GAZA, (PIC)– Israeli authorities declared a new plan to build a concrete wall tens of meters deep underground and aboveground to “counter the threat of Gaza tunnels”, Yedioth Ahronoth revealed Thursday morning. It has previously been estimated that such a project would cost tens of billions of shekels. However, under the new plan the construction costs are estimated to reach NIS 2.2 billion, according to the paper. “The wall will stretch along the 60 miles of the southern border around the Gaza Strip, and will in fact be the third defense system of its kind Israel has built along the border.” A senior Israeli war ministry official on Thursday announced at a press briefing that the next confrontation with Hamas would be the last one. The next conflict has to be the last conflict in terms of Hamas ruling the Strip, he claimed. Israel has launched three wars on Gaza Strip since the resounding victory of Hamas Movement in 2006 elections. In the 2014 summer aggression, more than 2,200 Palestinians, mostly children and women, were killed while thousands of homes were demolished. Een motie die de regering oproept de directe en indirecte financiering van organisaties die de BDS-beweging steunen te beëindigen, is vandaag aangenomen door de Tweede Kamer. De motie was ingediend door SGP, ChristenUnie en VVD en haalde en meerderheid door steun van het CDA. In de aanloop naar de stemming richtte een agressieve lobby van pro-Israël organisaties zijn pijlen vooral op het CDA. Zo riep “Christenen voor Israël”, dat de bezetting van de Westelijke Jordaanoever steunt, haar aanhangers op massaal e-mails te sturen naar CDA-Kamerleden om “achter Israël te staan”. In een “voorbeeldbrief” die Christenen voor Israël aan zijn achterban stuurde, wordt gehekeld dat “Israël opnieuw in het beklaagdenbankje geduwd wordt door Nederland.” De pro-bezettingsgroep dringt aan op een “koerswijziging binnen het CDA”, onder het motto “Steun Israël in plaats van hen te bestrijden!”. De drijvende kracht achter de lobby is de rechts-nationalistische Israëlische organisatie NGO Monitor, die Israëlische, Palestijnse en internationale mensenrechtenorganisaties bestrijdt die de Israëlische bezetting bekritiseren. NGO Monitor voert in dat kader ook campagne tegen het Human Rights and International Humanitarian Law Secretariatin Ramallah. In de motie van SGP, ChristenUnie en VVD wordt het Human Rights and International Humanitarian Law Secretariat op de korrel genomen, dat Palestijnse maatschappelijke organisaties ondersteunt en onder meer door Nederland wordt gesubsidieerd. Deze Palestijnse NGO’s zijn onder andere actief op het gebied van mensenrechten, juridische dienstverlening en maatschappelijk werk. Intrekking van subsidies zou de Palestijnse civil society in het hart treffen en negatieve maatschappelijke gevolgen hebben. De grote meerderheid van de Palestijnse NGO’s steunt sinds 2005 de strategie van Boycots, Sancties en Desinvesteringen (BDS), als een geweldloos en democratisch protest tegen de Israëlische bezetting van de Westelijke Jordaanoever en Gaza en de grootschalige schendingen van de mensenrechten. Nu de BDS-campagne internationaal steeds meer weerklank vindt, dragen de Israëlische regering en haar buitenlandse aanhangers een agressieve politiek uit waarbij getracht wordt de BDS-beweging te breken. Voorstanders van de bezetting van, wat door “Christenen voor Israël” in navolging van de Israëlische kolonisten wordt aangeduid als “Judea en Samaria”, schilderen de BDS-strategie af als een existentiële dreiging voor de staat Israël. In feite gaat het echter om een grassroots Palestijnse en internationale protestbeweging tegen de bezetting van de Westoever en Gaza, die inmiddels zijn 50e jaar is ingegaan. Minister Koenders – politiek geen voorstander van BDS – liet eerder weten dat steun aan BDS “geen afwijzingscriterium is voor financiering, aangezien uitlatingen of bijeenkomsten van de beweging worden beschermd door de vrijheid van meningsuiting en de vrijheid van vergadering”. Voor het Palestijnse maatschappelijke middenveld staat er veel op het spel. Niet alleen dat bij intrekking van de subsidies de bevolking verstoken zal blijven van vitale dienstverlening door de NGO’s, maar ook dat op grond van een oneigenlijke politiek debat in Europa de Palestijnen opnieuw in hun mensenrechten aangetast worden. Een stem voor deze motie is in feite een stem voor de bezetting. President of the Syrian Coalition Anas Alabdah proposed the establishment of a mechanism that would see the United States, Russia, China, Britain, France and Germany engage to find a political solution in Syria, ending the monopoly of the United States and Russia over the Syrian file, which has so far impeded efforts to reach tangible results or a political solution. Alabdah was speaking during a joint press conference with head of the National Coordination Commission Hassan Abdulazim in Brussels on Wednesday following the fourth consultative meeting between the two sides. Alabdaha pointed out that 513 civilians, including 57 women and over 200 children, have been killed in Syria in the first ten days of the month of Ramadan. Around 14 vital civilian facilities, such as bakeries and hospitals, have been bombed, while the number of besieged areas across Syria has risen to 50. The Assad regime has not yet lifted any blockade on the areas its forces besiege nor has it released any detainees from its prisons, he added. “We met here to salvage the political process which the Assad regime seeks to undermine through ignoring UN resolutions and lack of commitment to the Geneva III conference,” Alabdah stressed. Alabdah also said that the Syrian Coalition and the National Coordination Commission agreed on clear mechanisms to support the opposition’s High Negotiations Committee (HNC) in order to reach a just political solution and achieve political transition. The Syrian Coalition and the National Coordination Commission held their fourth series of meetings on 13-15 June in Brussels, hosted by Secretary-General of the European External Action Service Alain Le Roy. Conferees reiterated commitment to a political solution in Syria and stressed the need to intensify efforts to reach such a solution that would put an end to the tragedy unfolding in Syria and achieve the aspirations of the Syrian people.